With this book, Il Salabue begins an important new editorial project. It originated from a unique opportunity: that offered by an extraordinary family archive, the Lucci-Marchini Fund. Over more than half a century, numerous musicians, dealers, collectors and enthusiasts have passed through the laboratory of what was first Giuseppe Lucci's and is now Rodolfo Marchini's workshop. And with them, many valuable instruments. After careful and scrupulous research, the photographic archive is now made public for the first time, through an editorial series dedicated to the most important regions of Italy and to their greatest masters. This first volume looks at Lazio and Campania and presents 45 instruments of an extremely high standard, made by the most important Roman and Neapolitan maestros. Splendid masterpieces by Fernando Sacconi, Giuseppe Fiorini, Rodolfo Fredi, Enrico Politi, Antonio and Giuseppe Sgarbi, Giuseppe Lucci, Vincenzo Sannino, Vincenzo Postiglione, Alfonso Della Corte, Alfredo Contino, Giovanni Pistucci, Armando Altavilla, Vittorio Bellarosa. But also works by almost unknown makers like Vincenzo D'Aria and Giovanni Tedesco. 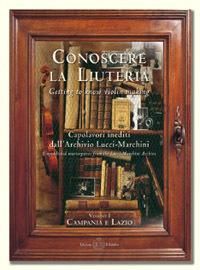 In a very elegant presentation typical of Edizioni il Salabue publications, the first volume dedicates four pages to each violin, including life-size details, as well as comparative tables of heads, sound-holes, side-views, information about brands, measurements, and internal details. Period photographs and articles and many other curiosities make the book even more interesting.